You may submit scholarship applications via email to info (at) madisonvfp.org if email is listed in the scholarship description as an acceptable method of submission. 2012 Scholarship winner is announced at Memorial Day Ceremony.The Madison VFP has many opportunities available to our local youth. Communicating with young people when they are forming ideas is very important. In an effort to reach youth Madison VFP has two programs available. 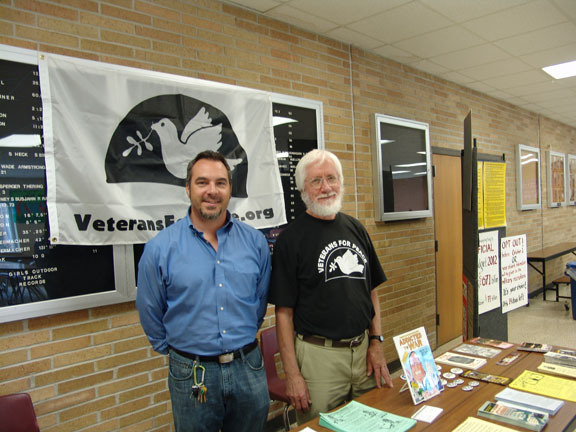 Truth in Recruiting – Madison VFP tries to educate and inform young people to the realities of military service and give them options. We have developed relationships with teachers and administrators in certain schools that permit us to set up informational tables and discuss the alternatives to military service while recruiters are in the building. Scholarships – Madison VFP sponsors an essay contest in which students are asked to address the question “Why is war (or violence) not the answer?” High school seniors in Madison and surrounding areas can apply as announced at each high school. Each year, one winner from a Madison high school is awarded $1,000 to enroll at Madison College (MATC). Most winners from five rural districts are awarded $500 scholarships. For more information on rural schools, contact David Giffey at barnowl1941@gmail.com. For Madison high schools, contact Paul McMahon at heartlandphoto@tds.net.